In December 1945, Dizzy Gillespie and Charlie Parker made history by bringing the frenetic sounds of bebop—then primarily an underground scene for in-the-know musicians—from the East to the West Coast for a two-month residency at Billy Berg’s Hollywood jazz club. It was the beginning of a harrowing and occasionally productive two year-stint for Parker bumming around L.A., showing up at jam sessions, crashing on people’s couches, causing havoc in public places (like stripping naked an walking through the lobby of the Civic Hotel downtown), and once in a while standing still for recording dates. Dope sick from his prodigious heroin habit, Parker could barely function on the lightweight skag circulating along Central Avenue; called “mud,” it was a ghastly concoction of unrefined opium with twigs and dirt still in it. He took to drinking gallons of cheap wine and popping or smoking anything that came his way. Local fan Ross Russell, owner of the Tempo Music Store on Hollywood Boulevard, was a bebop fanatic; he started Dial Records in 1946 specifically to record Parker’s music. Recorded between March 28, 1946 and December 17, 1947, the 35 compositions on the first two CDs in this box set are like a triptych of the wide, chaotic, and occasionally sublime swath Parker cut through SoCal. There are the heights, like Parker’s rhythmic four-bar break on Gillespie’s “A Night in Tunisia,” which stunned the assembled musicians and engineers with its virtuosity and velocity. There are also the wince-inducing lows, like the notorious “Lover Man,” in which Parker sounds like he’s breathing his last and the horn just happens to catch the wind he expels. (Parker never forgave Russell for releasing it.) After that session, Parker had a public breakdown and was sent to Camarillo State Hospital. Russell managed to assemble top-notch talent for Parker’s Dial sessions. Trumpeter Howard “Maggie” McGhee, pianists Dodo Marmarosa and Jimmy Bunn, bassist Bob Kesterson, and drummer Roy Porter all jammed with Parker at Little Tokyo’s semi-legal Finale Club. But the most famous participant was Emry Byrd. While manning a newsstand on Central Avenue, Byrd supposedly sold the best heroin in the city; Parker was so appreciative that he not only named one of his most famous songs “Moose the Mooche” after Byrd but signed over half of his royalties for his Dial recordings to the dealer, whose address, in short time, was switched to San Quentin. According to drummer Roy Porter, who drove Parker to the March 28, 1946 session, Parker started writing “Mooche” in the car at 35th and Maple Streets and finished it by the time they got to Radio Recorders Studios on Santa Monica Boulevard in Hollywood. “A Night in Tunisia” / “Ornithology” – After a disastrous and chaotic session at Glendale’s Electro Broadcast Studios, Russell reconvened Parker et al. (including a young Miles Davis) at Radio Recorders for this captured-lightning session of two rhythmically complex standards. 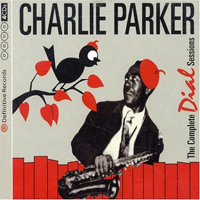 “Relaxin’ at Carmarillo” – Considering the genesis of this tune—Parker wrote it while playing in the Camarillo State Hospital jazz band—this is one of Bird’s airiest and most relaxed performances. That’s L.A. guitarist Barney Kessel on the solo.